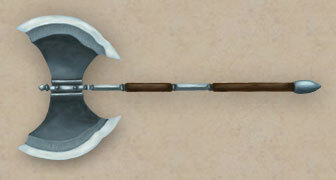 The battleaxe consists of a large double-bladed axe head set on a reinforced wooden shaft. It is primarily a one handed weapon, but may also be used in two. Skill type: Axes (also benefits from the Large Axe Mastery talent). Good styles: Mantis, Scorpion, Bull, Dragon and Crab.